"I feel pretty excited. It's a sensation between confusion, because I think I don't realize what I have just done, and excitement and happiness. It's a lot of sensation all at the same time," — Andoni Larrabe. At 22 years of age, Spanish poker pro Andoni Larrabe is the youngest player in the 2014 World Series of Poker Main Event November Nine. 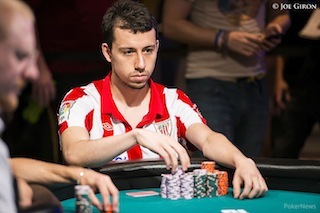 The Spaniard, who now lives in London, sits fourth in chips at the final table with 22.5 million. Larrabe, who lists reading, martial arts, meditating, and hanging out with his friends as among his favorite hobbies, now travels the live circuit, but before that he played multi-table tournaments online under the screenname “pollopopeye.” It was under that name that he captured two Spring Championship of Online Poker (SCOOP) titles. The first was in 2012 SCOOP Event #8-H$1,050 No-Limit Hold’em, which earned him $229,212.80, and the other in the 2013 SCOOP Event #17-M $215 NLHE 6-Max Turbo Super KO for $65,926.79. Prior to his deep run in the Main Event, for which he is guaranteed at least $730,725, Larrabe had $341,266 in live tournament earnings. That included $92,418 for an 11th-place finish in the 2012 European Poker Tour Grand Final in Monte Carlo — which Mohsin Charania ultimately won — and $218,710 for a win in the 2013 PokerStars Caribbean Adventure $5,000 No-Limit Hold’em. As far as the WSOP was concerned, before making the November Nine Larrabe had just $20,000 in WSOP cashes, all of which came in a one-week period during the 2013 WSOP. His first-ever WSOP cash came when he placed 284th in Event #54: $1,000 No-Limit Hold’em for $1,894, which he followed up with a 46th-place finish in Event #57: $5,000 No-Limit Hold’em for $14,333. A few days later, he placed 104th in Event #60: $1,500 No-Limit Hold’em for $3,841. Impressively, Larrabe stayed in the top 10 end-of-night counts from there on out. On Day 4, he chipped up to 2.195 million (seventh of 291), and then more than doubled that on Day 5 to finish with 5.47 million (fifth of 79). He maintained than position on Day 6, when he finished with 15.28 million, and on Day 7 he used it to navigate his way to the final table, though not without a struggle. The struggle was because on the bubble he was short on chips. In Level 34 (150,000/300,000/50,000) on Hand #17 of the unofficial final table of 10, Jorryt van Hoof raised to 800,000 from middle position and found a call from two-time bracelet winner Luis Velador in the hijack. Larrabe three-bet shoved all in from the hijack for his last 10 million. Action folded back around to van Hoof who threw his hand into the muck. Velador asked for a count and then went into the tank for about two minutes before announcing a call. Larrabe was in a dominating position heading to the flop with his pocket aces. The dealer fanned the on the felt, pairing Velador's king but keeping Larrabe out in front. The paired the board on the turn, meaning Larrabe needed to dodge a king on the river in order to score the double. The completed the board and Larrabe secured the double while Velador went on to finish as the final-table bubble boy. "I'm going to approach it as calm as I can," Larrabe told ESPN's Andrew Feldman. "There's a lot of time. I'll think about it, but the most important thing will be to go relax." After making the final table, Larrabe was out late celebrating with friends. As such, the next morning he missed the November Nine media day and became the only finalist PokerNews failed to add to our collection of video interviews. However, we’ll be sure to grab him for some on-camera fun during the break between now and the Main Event final table in November.